The grid is a long established system for setting coordinates that determine where any one place is located on the planet earth. Parallels are so named because they run parallel to each other and remain an equal distance apart across the map. The distance between parallels represents approximately 69 miles. This measurement can only be approximate because the earth is not a perfect sphere, but rather an oblate ellipsoid, which means it's a little bit egg shaped. Parallels are identified by degrees; the equator is 0 degrees, the North Pole is 90 degrees north, the South Pole 90 degrees south. The parallel lines that run east to west on a map measure the distance, by degrees, from north to south. Meridians run north to south, with 0 degrees being located at Greenwich, England. The meridian that runs through Greenwich is called the Prime Meridian. It divides the earth into east and west, much like the equator divides north and south. Unlike parallels, meridians do not remain an equal distance apart. They are widest apart at the equator and converge at the North and South Poles. The meridians, also identified by degrees then, run to 180-degrees east or west, with the 180-degree meridian being the International Date Line, located in the Pacific Ocean. Parallels and meridians form the grid on the map that allows you to locate a particular point on the map in terms of latitude and longitude. 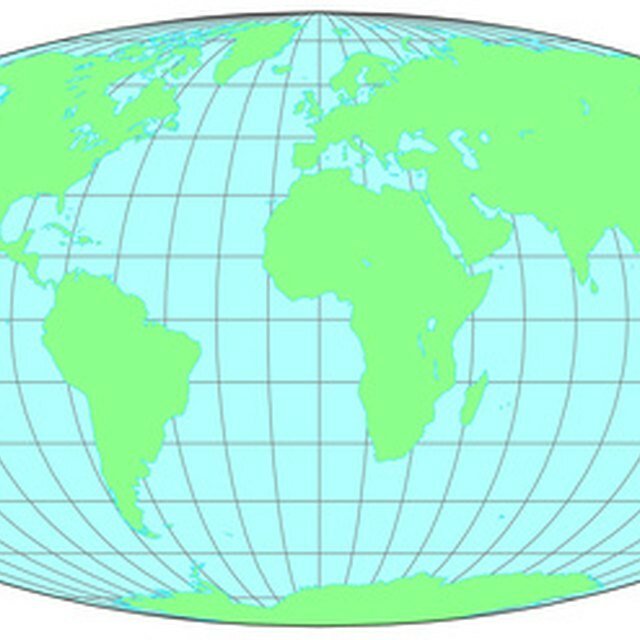 With parallels measuring distance from north to south and meridians measuring distance from east to west, a particular place on earth can be found by latitude and longitude. For example, the latitude and longitude of Phoenix, Arizona is 33.43 112.02. This means Phoenix is 33 degrees 43 minutes north of the equator and 112 degrees 02 minutes west of Greenwich, England. Where did the minutes come from? Degrees are divided into minutes, with each degree equaling 60 minutes. The development of parallels dates back to the Ancient Greeks. They used mathematics, geometry, poles and shadows, and the location of the sun throughout the year to establish on maps the location of the equator, the Tropic of Cancer and the Tropic of Capricorn. These were the first parallels. When the day and night were of equal time, it was the equinox. The position of the sun marked the equator. The Tropic of Cancer, which is 23.5 degrees to the north of the equator, denoted the sun's position for the Summer Solstice. The Tropic of Capricorn, 23.5 degrees south of the equator, is in line with the sun's position for the Winter Solstice. This merging of time and distance is necessary to establish a relationship on the map between where you are or any one place is located in relationship to the rest of the world. The minutes, then, are not distance measured in time between two points, but rather distance in terms of where the earth is in relation to the sun. Parallels and meridians make up a system by which any one place on the planet earth can be identified and located by the use of coordinates. Those at sea, using instruments that measure the angles between the sun and the horizon, or the North Star and the horizon, can determine where they are. To understand how to do this is a learned skill, one necessary to navigators, pilots and even astronauts. It is a system effectively put into place by astronomers and cartographers, and it began with the parallels. McRae, Shelly. "What Are Parallels on Maps?" Sciencing, https://sciencing.com/what-parallels-maps-4689046.html. 24 April 2017.